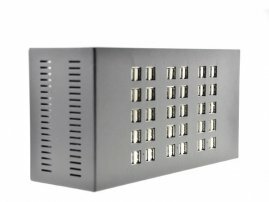 60-Port Super USB Charging Station [MOB004519-60] : Onchee.com - the accessory shop for all your handheld Electronics! Want to get an one-solution for charging your customers smartphones / tablets? Here is a clever solution. This Charger got a maximum 60 ports (40 ports and 20 ports also available) that can let you connect upto 60 devices at the same time. You will never need to worry about having not enough charger for your customers / vistors. - Built-in Protection Circuit that prevent your devices from excessive-charging and short circuit problem. - Please allows 7 ~ 10 days to ship.